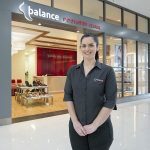 Emma has been working in Townsville since 2011, and joined My FootDr (formerly Balance Podiatry) in 2014. She operates full time at our Townsville, Thuringowa. She specialises in treating all conditions of the feet, ankles and lower legs utilising the latest technology to do so. She can treat all aspects of podiatry with special interest in sports injury prevention & management, biomechanics, & holistic management of chronic health conditions. Outside of work she enjoys health & fitness, gym, netball, bootcamp, walking/running Townsville’s infamous castle hill, travel; nutritious cook-ups with friends & spending quality time with family.